If you would like to register for a class, please call or email for space availability FIRST. When you receive a confirmation, you may then register. Class fee for the series is posted on my Blog. Make checks payable to: Jingle Jamboree Music. If you would like general information about classes, please send me an email or call me at (510) 334-8851. Refund Policy: The class fee is based on a $50 non-refundable (no exceptions) administrative fee. Classes are then refunded according to the remaining amount. Refund requests received two weeks prior to the beginning of the series or after will only be refunded if someone else takes your child's space in the class. There are no refunds after the first class (no exceptions). Partial credit can be given toward an upcoming class if illness prohibits the child from attending more than half the classes in the series. Refunds require a minimum of two weeks to process. FREE Previews: One free preview per family with prior arrangements required. Drop-ins: The drop in charge is $25, and only by special arrangements with the teacher. This includes siblings or friends who are not enrolled in a Jingle Jamboree Music class. Enrolled siblings may attend classes at any time for free. However, this does not include "Sibling Music Classes" where both siblings must register and pay for the class. Liability: The children are under the supervision of their parent or caregiver at all times during the class, thus it is the parent/caregiver's sole responsibility should any injury occur. Jingle Jamboree, its director and teachers are exempt from any liability in case anyone is injured during the class. Audio/Video Recording: In order to honor copyrighted material, electronic recording is prohibited. Visitors: In order to enhance your child's musical experience please keep visitors to a minimum. Children not enrolled in Jingle Jamboree Music classes may not visit without prior arrangements. Grandma & Grandpa and Aunts and Uncles are always welcome, but please caution them to listen quietly with their cell phones off. An occasional picture is okay as long as the children do not seem disrupted by it. Cell Phones: Please turn them off or to silent during music class. Please do not check your messages during music class as it can be heard in other parts of the room. Side Conversations: Please no side conversations during the singing of the songs. Your children will have an enhanced learning experience if you remain focused on the class. Use your best judgment and talk only between songs and during transitions. If you have an older student (ages 3 years and up), please observe quietly during class. Dozing off is permitted as long as you do not snore, however you will probably miss something cute. I will make every effort to sing, move, and enjoy the class while staying focused on the music and activities. I will enjoy the musical experience, while not coaching or pressuring my child to perform during class. 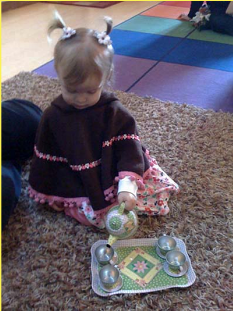 I understand many children learn best by observing during class and performing at home. If my child does perform during class, I will be even more delighted than the instructor who will surely be elated. I will refrain from side conversations that interrupt the class, but will enjoy short comments and discussions during transitions from one song to another. I will make sure that my cell phone and pagers are turned off or to the vibrate mode. If I must answer the phone during class, I will step outside before talking on the phone. If my child becomes distracted during class, I will find a playful way to bring them back into the circle in order to help them become engaged in the class. I will keep snacks to a minimum during class, but everyone understands they are a must at times. Overall, I will attend Jingle Jamboree Music classes with a joyful attitude that will give musical enthusiasm to my child and everyone around me. Please note: You may register in person on the first day, only if there are any openings. Please call or email me regarding space availability.